The feeling often comes over you when visiting wineries around Cape Town that as you drift from one to another, they’re all in some form of competition to be established in the most incredible settings of nature imaginable. It would admittedly be quite hard to trump the location of Zorgvielt, lying at the bottom of the Banhoek Valley just outside of Stellenbosch proper. 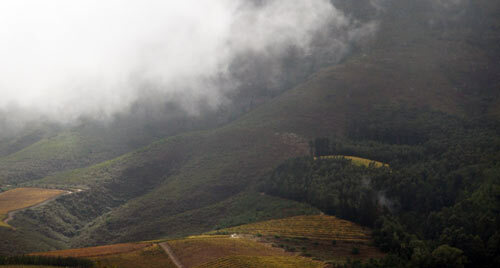 Part of the “Greater Simonsberg” sub-region, it sits on the side of the meandering road to Franschhoek. While thoroughly modern, it is based in lovely, late 17th century buildings. Despite changing hands a number of times (most recently in 2002), the property had a gap in real wine production of about 250 years, although small amounts have generally been made throughout. Since 2003, Neil Robert Moorhouse has been the head winemaker. A graduate of the Elsenburg College Agricultural College in Cape Town, he’s expanded their portfolio to include: Sauvignon Blanc, Semillon, Chardonnay, Viognier, Chenin Blanc, Cabernet Sauvignon, Merlot, Cabernet Franc, Shiraz, Petite Verdot, Malbec, Tannat (he believes this grape has a huge future for SA), and Pinot Noir. All fermentation is in stainless tanks that is then transferred to French oak for final aging. They’ve broken their vast offer of wine down to two lines: Silver Myn and Zorgvielt. The Silver Myn are easy drinking, lower cost wines that are all screw top. 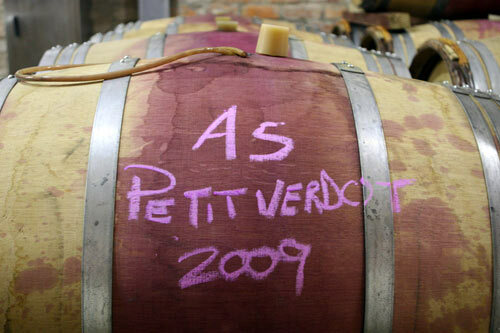 The Zorgvielt are higher-end wines that are aged longer and more complex in the composition.